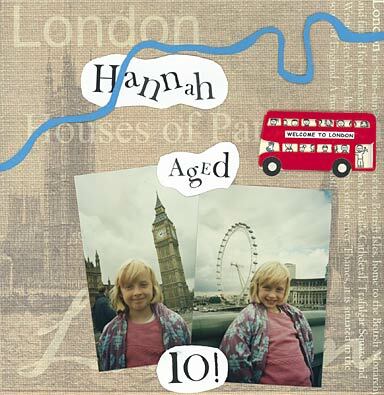 My London scrapbook layout was 'born' several years after taking my daughter Hannah to London for the day. I stumbled across a scrapbook paper that demanded a layout from me. I couldn't resist making a London scrapbook layout once I'd seen Jayne Bentley's attractive London 12 x 12 paper design. I particularly liked the foggy grey colour - tell it like it is, Jayne! I love 12 x 12 background papers with a strong theme. They give the flavour of your layout such a 'head start' - and nobody calls you a cheat! This paper is Jayne Bentley's 'Guy Fawkes' paper. Mind you, if he'd had his way, she'd have struggled to find the subject matter for this design. There's no law stating that all your layout embellishments have to come ready-made in a polybag marked $2.50. I decided to make an optimistically blue River Thames (brown wouldn't have shown up so well). Also, the white areas with the journaling are supposed to be clouds. Er....right. When I began this layout I had the idea of the '1' and '0' in my head to begin with. Normally I tend to begin and then have plans later! What I like now - since discovering Jen Gormley's '500 Scrapbooking Sketches' is that a simple line drawn sketch can now be my road map as I create the layout, so I don't waste time changing my mind about the page - plus it's fun bringing a sketch to life. Once I'd dug out these photos and found the 12 x 12 paper, I was hunting for London items for my modest stash - which was harder than I expected. I then found this nice stick-on London bus embellishment. The moment I recall who makes it - I'll post the information! No, NOT Downing Street. I got the idea for 'number 10' when I saw my photos of Big Ben and the London Eye lying side by side. If they'd been the other way round - I'd have missed it!